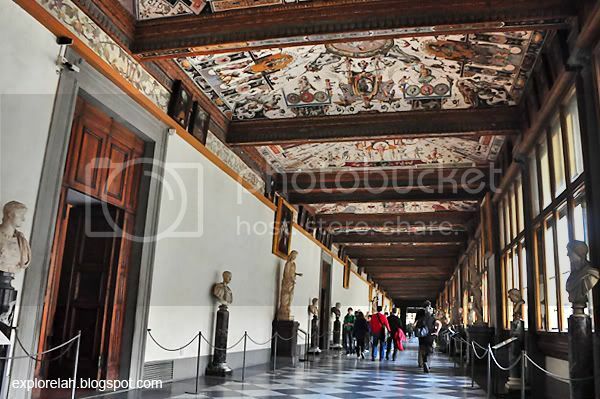 To get acquainted with the European artistic heritage and tradition, there's no place better than Uffizi Museum. Housing a mind-boggling collection of paintings, carvings and sculptures, it is perhaps one of the world's most important museums. And an astoundingly beautiful one. But if you ask me, there's really no need for dedicated venues to house the artistry of this civilisation as the whole of Florence is one mammoth outdoor museum! Time to get lost in time. Like spreading arms to welcome visitors, the embrace of beauty starts with the museum's visage. The Uffizi belonged to the powerful House of Medici, an extremely wealthy dynastic family in Florence during the 14th century. It was initially closed to public and used as a means to show off the family's wealth to the society's elites. You have to be someone important in order to be invited into its galleries. However, the Medici empire started to decline in the 18th century when Poland invaded Tuscany (Tuscany is region in Central Italy and Florence is its capital city). Just before its entire collapse of the Medici house, which meant losing the museum and its precious collections to the Polish invaders, the family's last surviving member, Anna Maria Luisa de' Medici willed all the family's remaining possessions to the Tuscan state with the caveat that nothing be taken out of Florence. 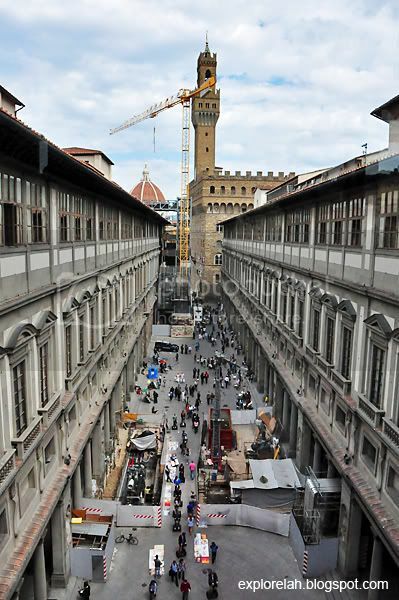 Looking out at the gallery square from the central window on level 3 of the Uffizi. The yellow castle-like building is the Signoria Sqaure and the reddish-brown dome in the background is the Florence Cathedral. Thanks to this clever move by the last link to the Medici dynasty, the Italian artistic heritage escaped plundering and finally opened its doors to the public in 1765. 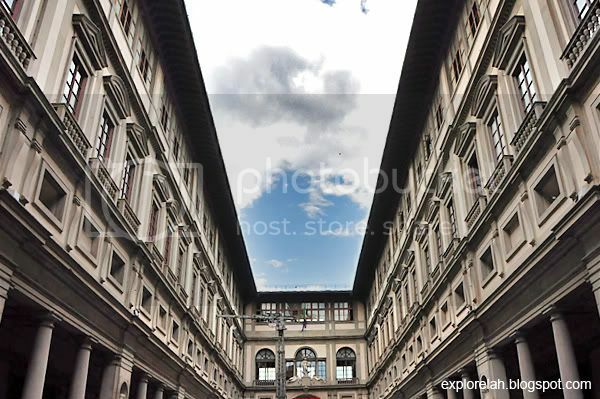 The Uffizi is open from Tuesdays to Sundays from 8:15am to 6.50pm. Expect to pay about €21.00 (Standard Ticket) and it is best that you book your ticket online to beat the long queue on site. 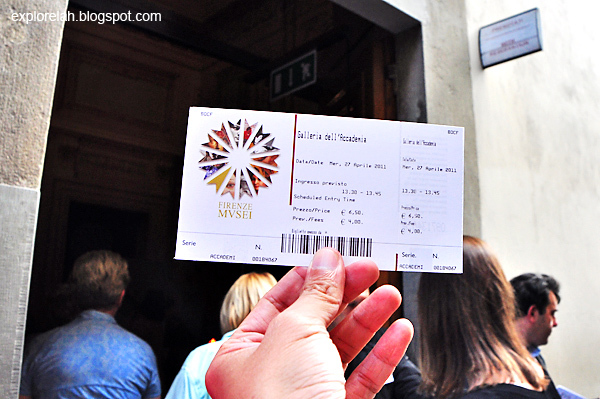 Our tickets were all arranged by our tour guide so I do not have direct experience with online ticketing but I found this site that offers ticket services - tickitaly.com (Florence, The Uffizi). Enthralled by statuesque masterpieces down Uffizi Gallery's East Corridor. The museum assembled distinguishing works by great artists such as Botticelli, Leonardo Da Vinci, Michelangelo, and Raphael that spanned the Gothic, Renaissance and Baroque eras. My only grouse with the Uffizi is this... photography is prohibited! I tried to take a shot, my tour guide stopped me. Undaunted, I attempted to sneak another shot of the gallery environment, a staff promptly waved a 'no'. Even the local visitors frowned when I so much as lifted my camera. I'm not trying to be deliquent and respect the no photography policy but I just wanted to get some shots so that I can remember my visit. 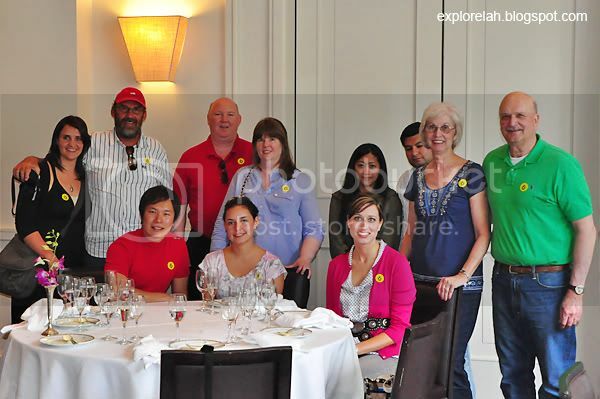 All the photos you see here, I've endured disgusted looks and practised ninja to get them! Hope they'll help give you a peek at what to expect. I'm not particularly cultured or drink tea with my pinky up, but this quick browse of the gallery helped me understand why art is to be treasured and appreciated. Apart from the paintings being ancient photographs of what's life like in eons past and defining the echelons of techniques, the works were also imbued with deeper meanings and represented the beliefs of the artists. But what's most interesting was to observed the changing impressions of Christianity through the ages. In the earliest religious paintings, the portrait of Mother Mary with infant Jesus were mostly abstract forms. They were abstract because the understanding of Christianity back then was mostly spiritual, that God is a spirit. However, over the years, as the people's perception of Christianity changed, the Madonna with child portrait slowly took on more humanistic features and leaned towards realism. 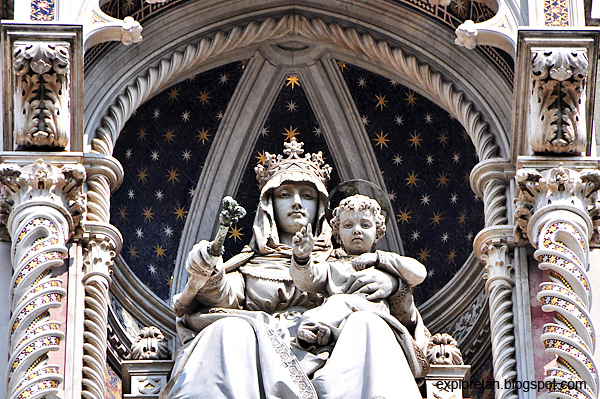 Even the body language of the holinesses had subtle changes - from one of where their eyes and hands were inward-bound (mother and child looking at each other), like deities to be worshipped, to a softer, more approachable feel where the eyes look at the viewer and the hands are opened and welcoming. God has become human. This photo doesn't do the painting justice as the crystalline quality of the sea is not apparent. I dunno how to critique art but the artist's technique really seem to make the waves sparkle. Swee! 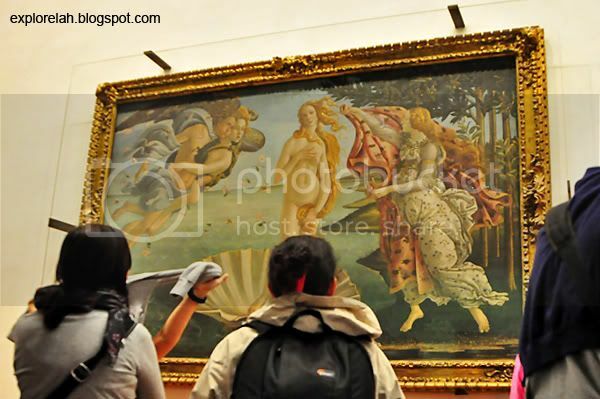 My favourite painting at the Uffizi has to be The Birth of Venus painting by Sandro Botticelli because of what it represents - a harmonious fusion of the spirit and body with nature. Here's the rationale behind that interpretation... The figure of Venus in the middle is helped by the gods to the left (spiritual wind) while on her right, a maiden brings on a cloak (material object) and the scene is set amidst one of nature with the sky, sea and land represented. The meaning is so beautiful! 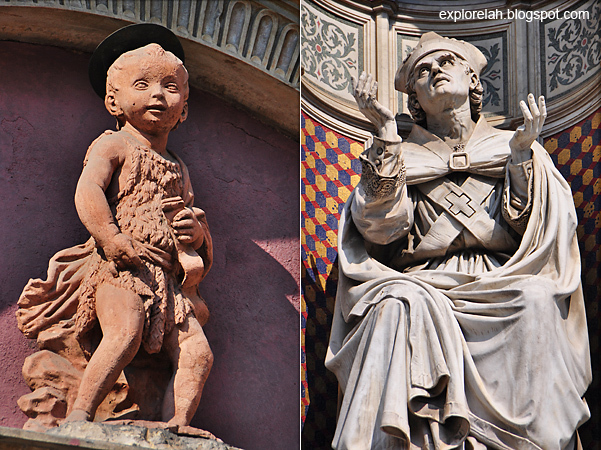 Also known as the Square of the Gods, the Piazza della Signoria exhibits an eclectic collection of pagan statues. Most of the statues are congregated at the Loggia dei Lanzi, a chamber-hall with 3 broad arches at one side of the square. 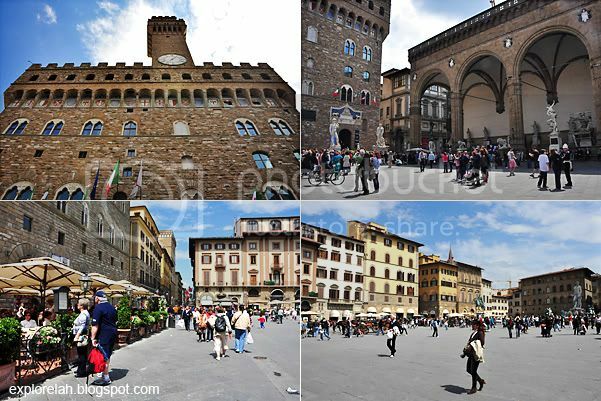 Located right next to the Uffizi Gallery, the square has been used as a civic center for centuries and is dominated by the castle with a clock tower, the Plazzo della Signoria. Public rallies and executions were held here during the Medieval times. 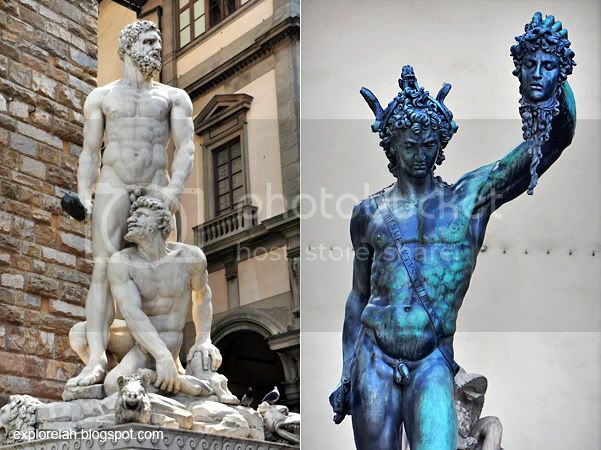 Left : Often critised for being ugly due to its disproportion in size with its surrounding figurines, the statue of Neptune towers over a fountain on one side of the Signoria Square. 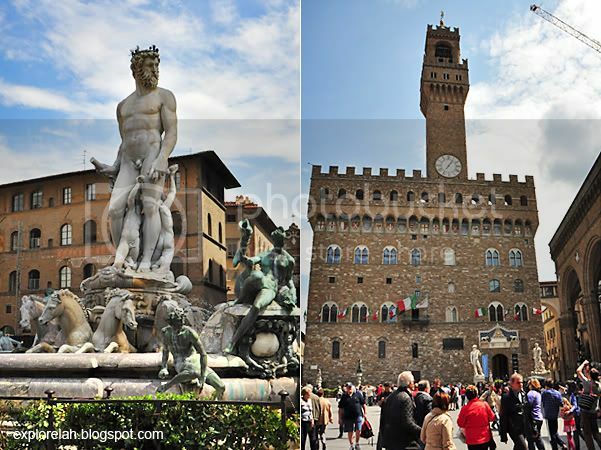 Right : A statue of David and demi-god Hercules stands guard at the entrance to Plazzo della Signoria. 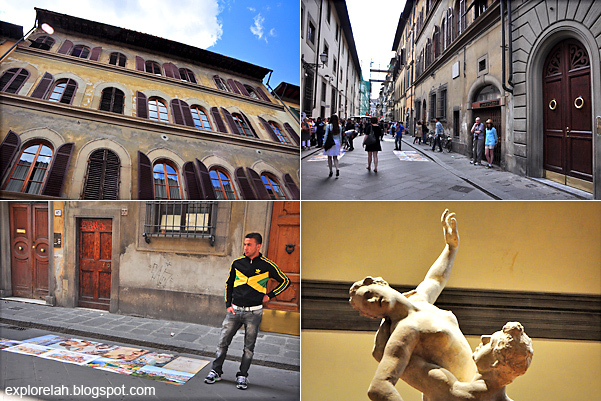 Florence has 3 statues of David - 1 original, 2 replicas. A bronze replica is found at the Michelangelo Square overlooking the skyline of Florence while this marble replica is installed at Signoria Square. Inspired by the Biblical account of a small boy, David, who killed the giant Goliath with a mere slingshot, the likeness of David has come to represent the weak's triumph over oppression. Left : Hercules defeats Cacus by Baccio Bandinelli (1536). 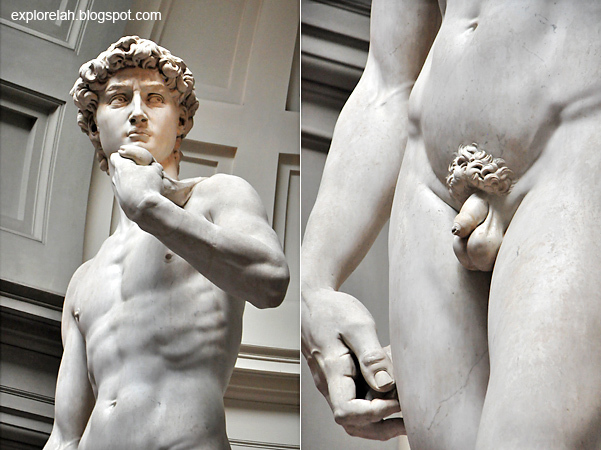 The white marble sculpture represented physical strength and contrasted with David's representation of spiritual strength. 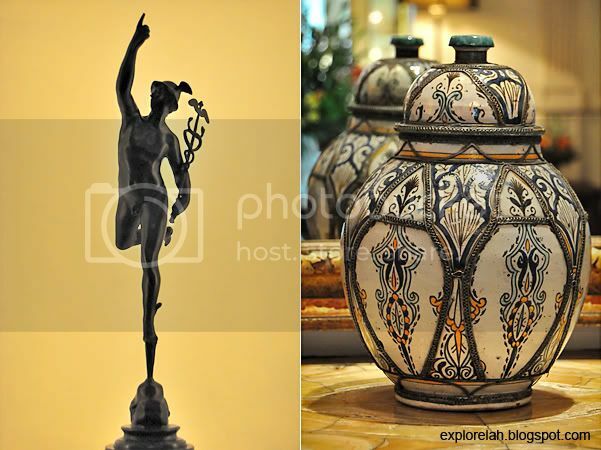 Right : Bronze statue of Perseus triumphantly holding up the severed head of the Medusa, a symbol of wit over evil. I guess those attributes are all essential distractions from the very small dicks that the heroes seem to have! Hahaha. There are a lot more very interesting sculptures that I wanted to photograph and study more closely but as it is characteristic of guided tours, rush is the buzz word. 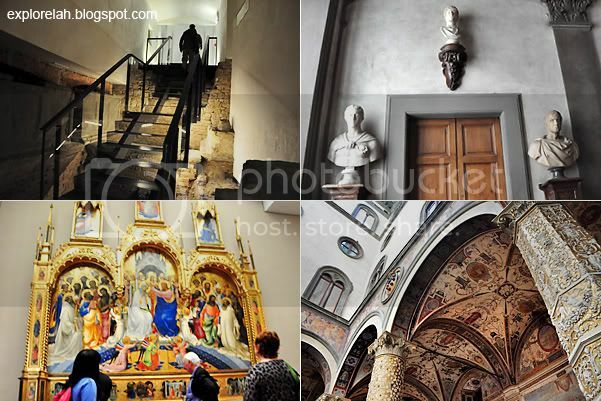 This visit to the Uffizi Gallery was very rewarding but exceptionally exhausting for me as I had to find my photographic angles quickly, fight the crowd to catch up with my group while listening in to the guide's explanation and stories of the artwork. Overload! 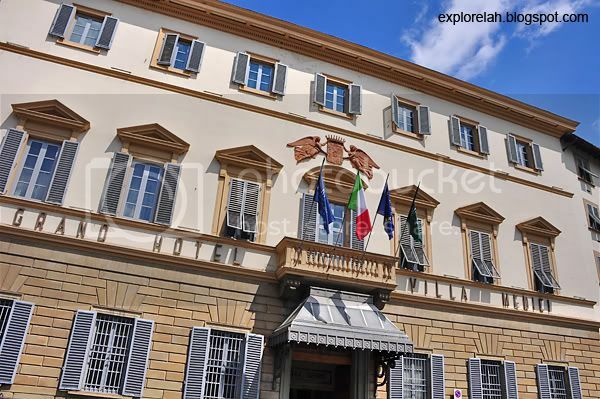 After an exhausting morning, I was so comforted that the next item on our itinerary was lunch at the 5-star Grand Hotel Villa Medici. Yay! The entrance to the hotel is rather inconspicuous and its building visage somewhat unremarkable after all the architectural jaw-droppers we'd encountered, but the plain exterior beguiled a lush within. 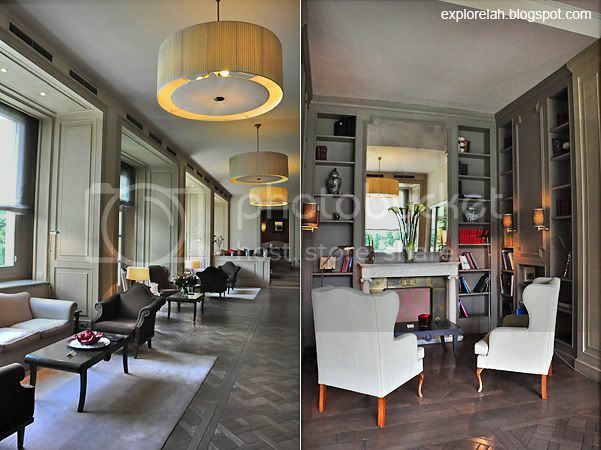 Classical elegance accentuated with artful antiquities gave the hotel an up-class homey feel that had the right amount of opulence and simplicity. Lunch was interesting. 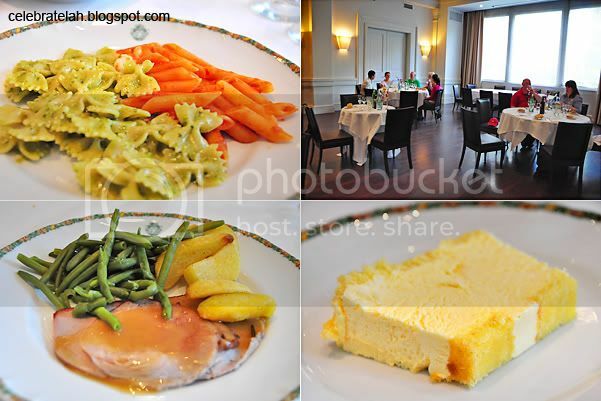 We started off with a full plate of pastas as appetisers before a couple of paper thin pork cuts were being served. I was already so full from the pasta, and wines, by the time the main course arrived. One point to note is that if the pasta feel like they're not cooked thoroughly, bear with it. I was told this is how the Italians like their carbs. Burp full of pasta, we took a short ride and arrived at the Accademia Gallery (English : Academy Gallery). The gallery is open from Tuesdays to Sundays from 8:15am to 6:50pm and you can expect to pay about €10.00 for a ticket that includes entrance to any specialty exhibitions that may be ongoing. Tucked to the side of a narrow street, blink and you'll miss the entrance to the gallery if not for the queue to get in. The Accademia Gallery don't see as many visitors as the Uffizi but this is a must-see because the art museum is home to the original statue of David by Michelangelo. Again, photography is prohibited and again, I used ninja photographic skills to take pics of the original David. And a close-up of his crotch! 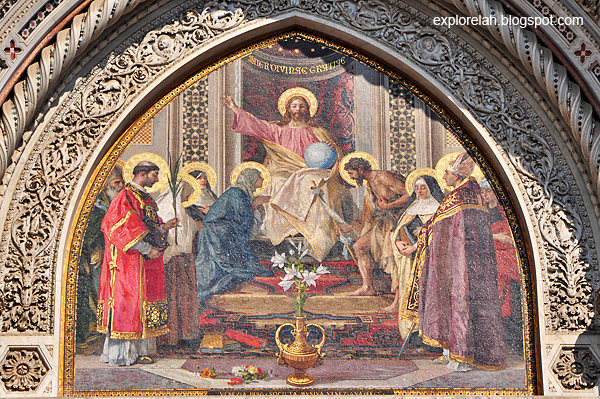 Here's something that you may not know about the master artist, Michelangelo. He is ugly, dirty and smelly! Written accounts of the painter and sculptor by peers described him as a man with small eyes and a crooked nose who has the habit of wearing dog skin socks for months without taking them off. The socks often get stuck to his feet and when he did remove them, his skin came off as well! And he could go on months without bathing. Yucks! He was also a miser who didn't trust anyone with his monmey and kept them hidden around his house. When he died, a relative ransacked his home and left no inheritance for his rightful heirs. 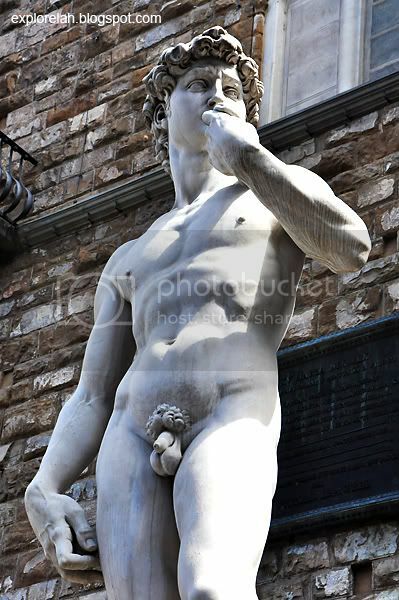 The statue of David took 3 years to complete (1501 - 1504) and was originally slated as a mantle piece on the roofline of the Florence Cathedral. But by the time it was completed, the gigantic and heavy statue was impossible to lift to the rooftop and Signoria Square was decided as its new home. However, the original statue was eventually moved and replaced with a replica to protect it from weathering. A statue of David isn't a new conception by Michelangelo but what's different in his version compared to earlier works is that his David didn't include Goliath. The other statues usually depicted the young hero victorious over a head of the giant while Michelanglo captured the intense expression of a pre-battle David. In today's movie terms, Michelangelo created a prequel! 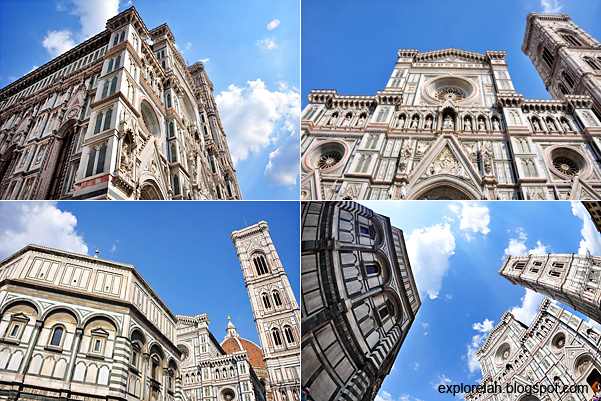 Our last and final stop is the famed Florence Cathedral, originally referred to as the Duomo (a generic Italian term for cathedral church). Construction of the cathedral began in 1296 and full completion was achieved with the crowning of the cross and copper ball atop the dome in 1461. The dome stands as the world's largest brick dome ever constrcuted to date. The cathedral square with the octagonal baptistry in the foreground. 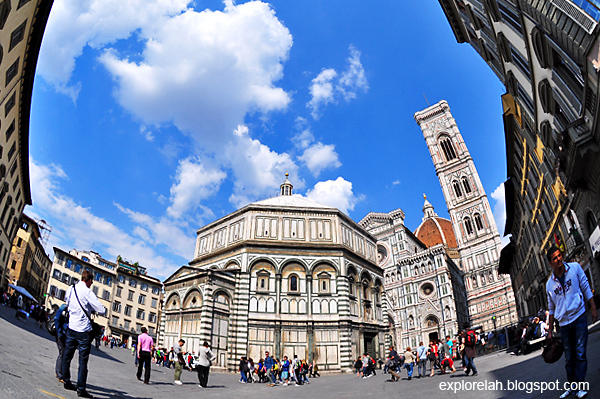 It was built between 1059 and 1128 in the Florentine Romanesque style. I've been here in 1997 and it felt rather strange that nothing has changed in the past 14 years! Wow, 14 years. So fast. This tour, like my previous visit, just gave enough time to take some photos of the exterior of the church. I was hoping I could get inside during this trip but half an hour here didn't give me much time but to capture as much as possible of the monument's exterior. Besides, there's a queue to go in. Gates of Paradise on the baptistry facing Florence Cathedral. 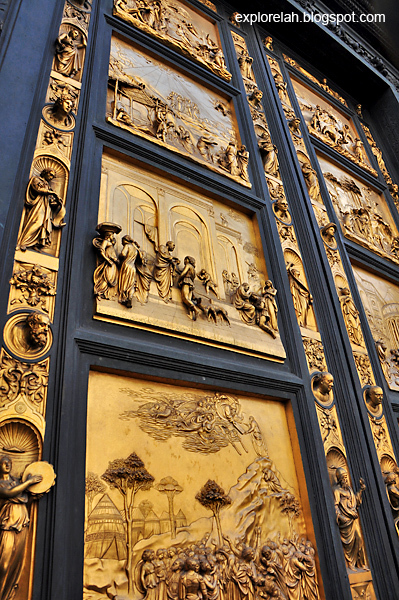 The bronze bas reliefs on these doors took the main contributing artist, Lorenzo Ghiberti 21 years to complete. He was 21 years-old when awarded the artistic endeavour. 2121... must buy 4D! We concluded our full-day shore tour to Pisa and Florence at the cathedral before the close to 2-hour ride back to the port where Liberty of the Seas waits. I started this post with an anecdote of an ex-romance intertwined with the sights in these 2 Italian cities. And I would like to end this excursion with a lesson about love. Like building the monuments, the process to build a lasting relationship may be arduous and long, but once it has been completed, it'll withstand the test of time. Even if it didn't work out in the end, and a break-up occurs, the splendour of having loved and be loved lasts a lifetime. Your post reminds me of the best memories I ever had back in year 2008 when travel around Europe. what camera are you using? the photo are awesome. Are you using fish eyes mode? Feel free to visit my blog - A Malaysian gal who blog about travel too. 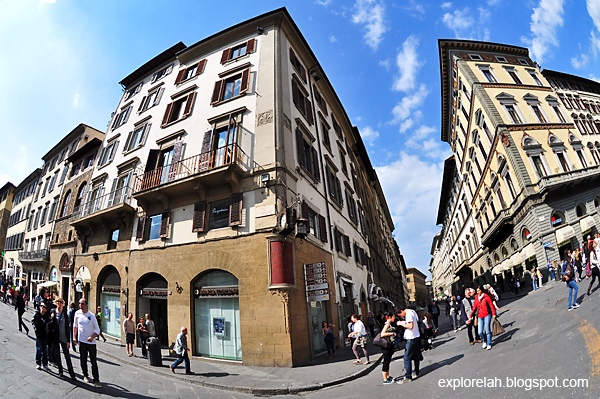 Uffizi Gallery is, without a doubt one of the biggest treasures Florence has to offer.